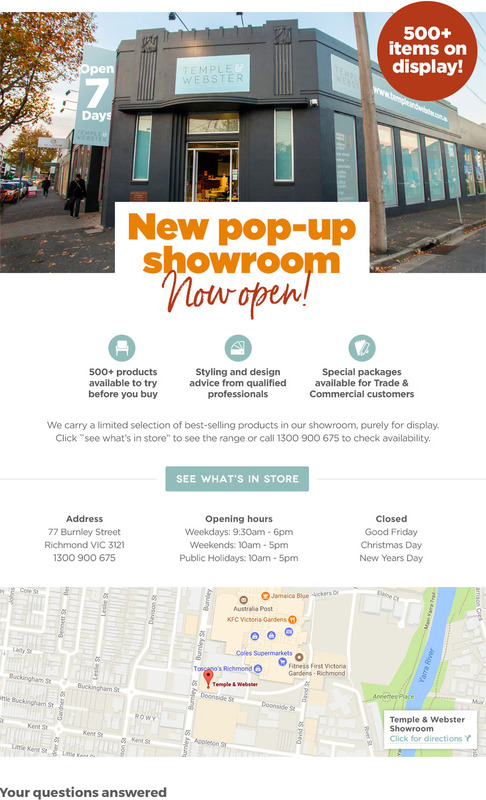 Visit the Temple & Webster showroom in Melbourne at 77 Burnley St, Richmond VIC 3121. We’re planning to open more locations for your convenience soon. The Temple & Webster showroom is home to a selection of our bestselling furniture and homewares products so you can try, touch and feel before you buy. See the range of products available to view and order in our Melbourne showroom. The Temple & Webster showroom accepts payment via Visa and MasterCard. Please note: The showroom cannot accept cash. Delivery is available Australia-wide on products in the Temple & Webster showroom, which our staff are happy to arrange for you. Most products can be delivered within a few business days. Delivery fees and times vary for different products and are calculated based on the size and weight of your order and the destination. We offer instalment payments through zipPay (up to a maximum of $1,000), unfortunately we do not offer lay-by. We want you to love the products you buy from us. If you change your mind, you may return items to us within 30 days of the date you received it, no questions asked. Please see our Returns Policy for full terms, conditions, inclusions, exclusions, fees and charges. Please note: The showroom cannot accept in-person returns. For changes or cancellations please contact us as soon as possible and we will endeavour to accommodate your request. Please note: for Next day and Fast Track dispatch items, no cancellations or changes may be possible. Please refer to our Cancellations Policy. All sales transactions from the Temple & Webster showroom are bound by our general Terms and Conditions.